Einkorn (triticum monococcum) is one of the oldest cereal grains to be cultivated by man for human consumption. Together with other ancient wheat types, Emmer and Spelt, these were once one of the most popular types of wheat grown in the UK. The Einkorn crop grows tall in the field, with an unusual, short, flat, two-row seed head which encloses small wheat like grains encased in inedible husk. 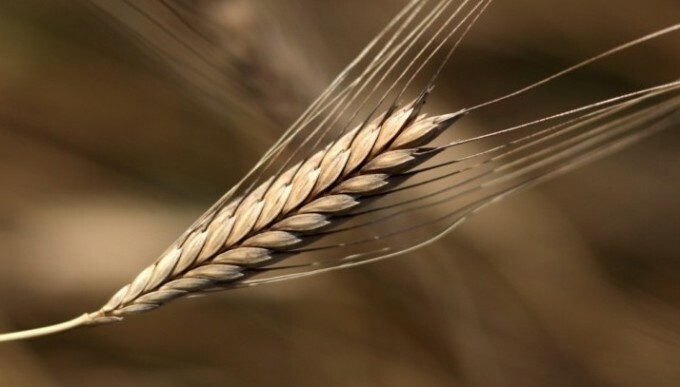 Einkorn thrives in poor soil and in adverse weather conditions, typically found in Britain. When harvested the small seeds are enclosed in an inedible outer husk which must be removed prior to milling or cooking. Einkorn can be eaten as a grain, porridge or milled into a golden flour which is soft in texture and excellent for making rustic breads or artisan cakes with a distinctive nutty flavour. Iron Age man was able to grow and eat Einkorn (Baker 1978) because of its ability to survive on poor soils and in bad weather conditions. ‘Einkorn was favoured in place of traditional wheats’ (Lapidge et al. 2001). According to research conducted into heritage cereals by the Agronomy Institute in Orkney, Einkorn is the oldest type of wheat. Evidence of Einkorn’s existence in prehistoric times comes from the discovery of carbonized seeds, pollen grains and impressions of seed fired into pottery. This type of evidence has been located at the Iron Age site of Butser Ancient Farm, now an archaeological open air museum, located near Petersfield some 70 miles from a group of farms now growing Einkorn. By the 8th Century…Einkorn, Rye, Barley and Oats were the main cereal foods found in England. (Lapidge et al, 2001) However improvements in grain storage methods, the difficulty of threshing Einkorn to release the grain and greater yields of traditional naked wheat eventually led to its demise. Einkorn fell out of popularity in Roman Times, when grains with bigger yield and requiring less processing became commonplace. Since then, the planting of Einkorn has been relatively unknown.